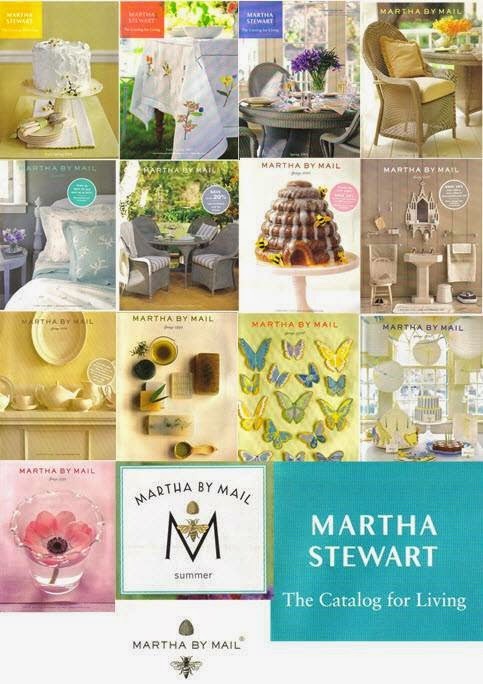 It was back in 2000 when I encountered the Martha by Mail catalog just as we were moving into our first home. The idea of starting a home with a blank slate was new and exciting for us, so at the time I turned to the trusted source for everything concerning the home. What was it about this catalog that captured my attention from the moment I saw it? Was it the unique product line designed and selected by Martha & the editors of her company that wasn’t available elsewhere, or was it that I noticed and picked up on what America’s lifestyle maven was using in one of her television segments, and had to have it? Actually, it was a mixture of several things. I had never in my life come across a catalog which encompassed so many facets of the home with such beautifully-designed, high-quality products. Martha by Mail contained items ranging from crafting, gardening, homekeeping, baking, cooking, pantry, home decorating, entertaining, weddings, catering, outdoors, holidays, pets and even baby. Many companies, artisans, food purveyors, craftsman and designers were gathered from all over the world to create for this catalog, and it was through thoughtful designs from the team at MSLO that made many of these products timeless and stand out above the rest. L.E. Smith, Mosser, Frankoma, Robinson Ransbottom, NordicWare, Wilton, Ateco, Lloyd Flanders, Sterling China, Broggi, Chiarugi, Krosnos, Juliska, Jenaer Glas, Rainer, Michael Bonne Copperworks, Fenton, Bernhardt Furniture, Eleni’s, Niman Ranch and CK Products, were just some of the silversmiths, food purveyors, foundries, glassworks, potteries and furniture makers which provided products for the catalog. It was a very good era for us collectors who became enamored with the catalog. Martha and her team understood how important it was to source & produce from the very best. 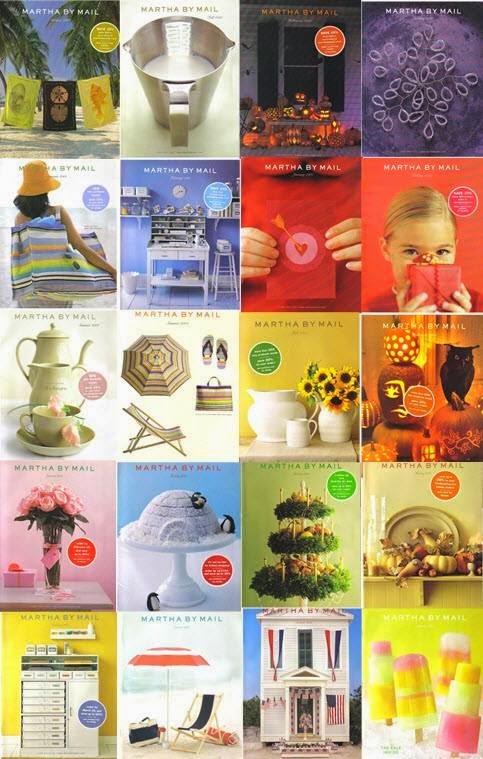 Collectors can’t seem to get enough of the discontinued Martha by Mail catalog. As you can well imagine, many of these products have now become classic collectibles, which, depending on the rarity, can command prices that are many times what they were originally. Who doesn’t remember the Hotel Silver, the blown glass pedestal fish bowls, the heavy cast-aluminum animal cake pans, the American made jadeite, the Wedgwood earthenware & bone china, the glass canisters, the creamy Burleigh Ware, and the araucana egg soaps? These are but a few of the now-classic and highly sought after items. 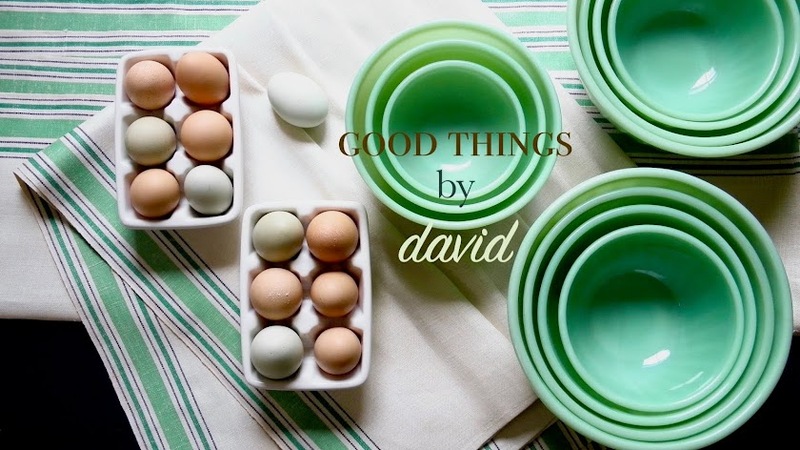 I’ve written extensively about my collection of copper cookie cutters and other keepsakes from this catalog here on Good Things by David, but I’ve never really written about the catalogs themselves. It was because of an exceptionally generous gift of Martha by Mail catalogs I received recently from my very good friend, Kenn, that I began to think of the reasons why a good amount of us have kept these past issues. Several of my collector friends chimed in when I asked them to share their thoughts. If you collect Martha by Mail, subsequently called The Catalog for Living, or are just beginning to collect from the assortment of products out there, take a look at these beautiful images of the catalog issues. There is even a scan of a complete catalog for you if you’ve never had the pleasure of seeing one. A selection of the most iconic issues. In the late 1990s, Martha by Mail commissioned brand new jadeite from three of the most eminent glassworks in this country. L.E. Smith, Fenton & Mosser went through their archives, at Martha's request, and brought back certain patterns, while creating other 'fantasy pieces'. These new interpretations, such as the jadeite turkeys, did not stem from classic jadeite pieces produced in the 1940s & 1950s. 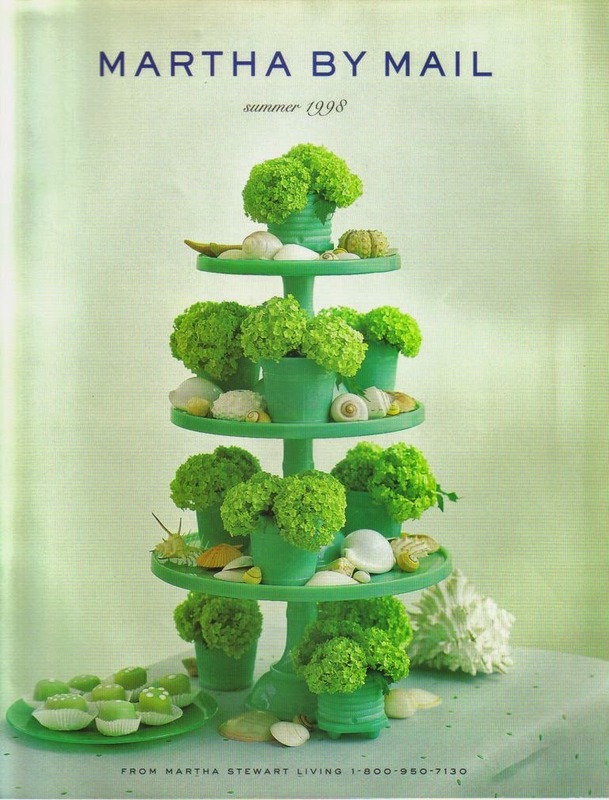 Martha by Mail jadeite graced the catalog covers twice. 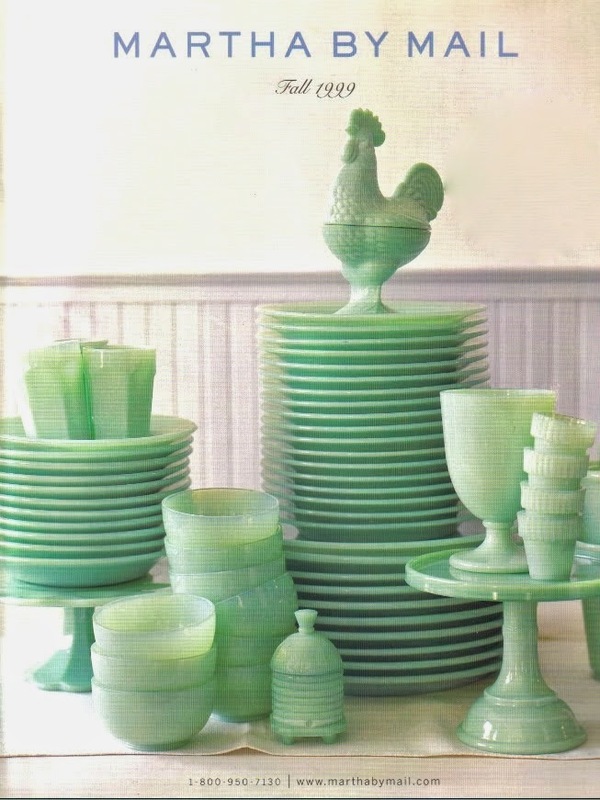 This particular Fall 1999 catalog shows a rooster covered dish, faceted tumblers, cake stands, soup bowls, cereal bowls, plates, a honeypot and vases. In a future post I will showcase Martha's pressed glass in its various colors from the catalog. 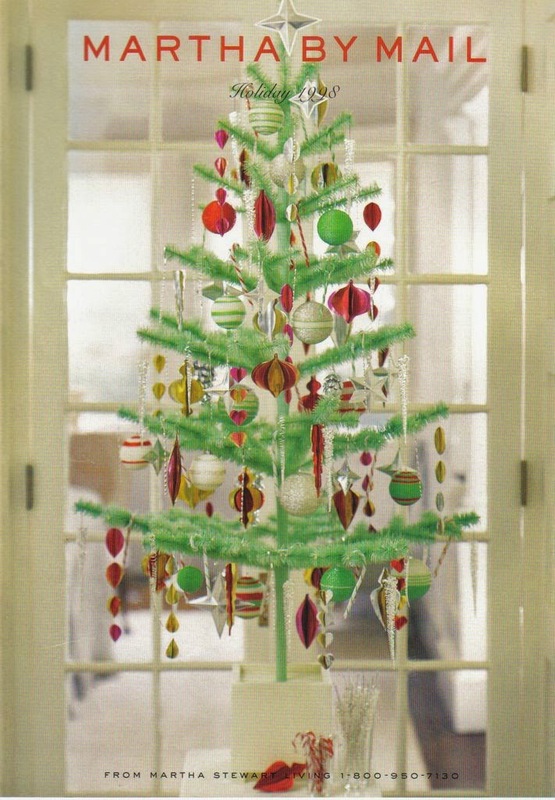 A goose feather tree in a light green shade was another iconic product made exclusively for Martha by Mail. Festooned with ornaments made from crafting kits, the trees have seldom exchanged hands through the collectors market. 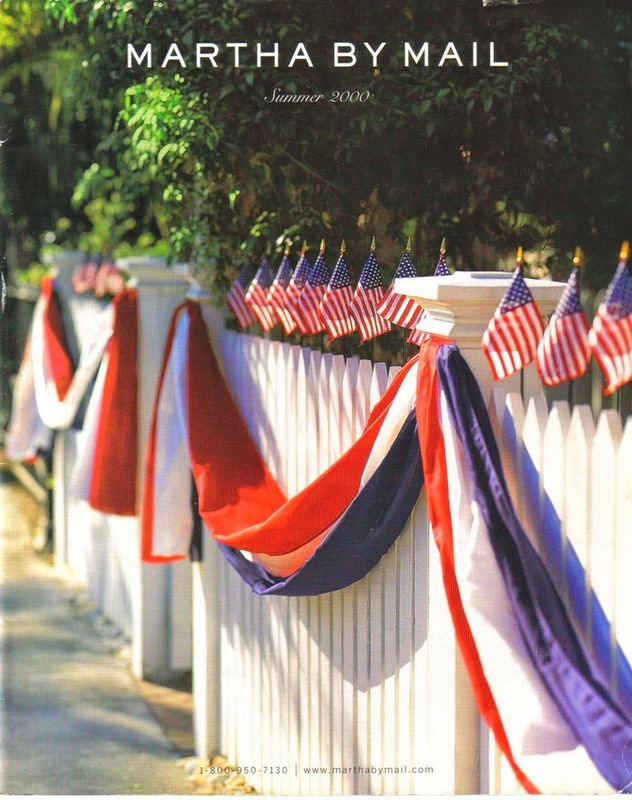 A white picket fence covered in patriotic bunting and miniature American flags makes this cover especially striking & memorable. 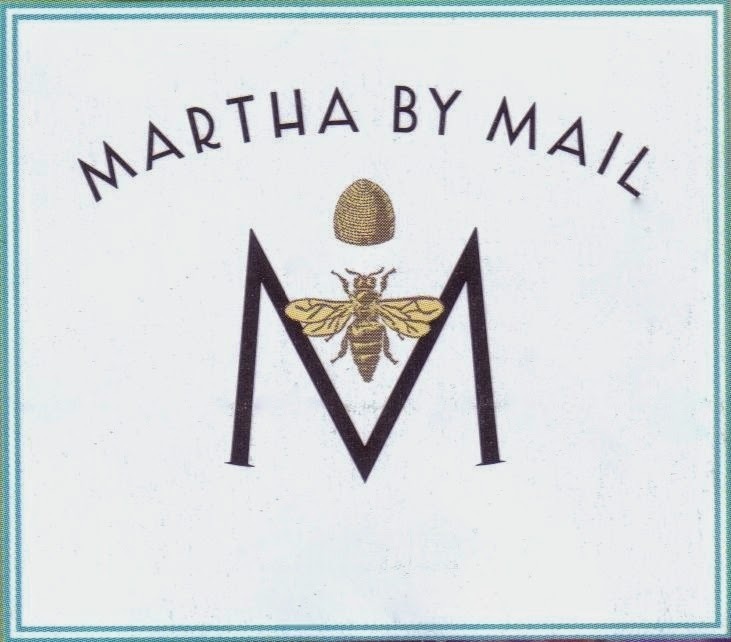 The Bee & Hive symbols were representative of Martha by Mail. 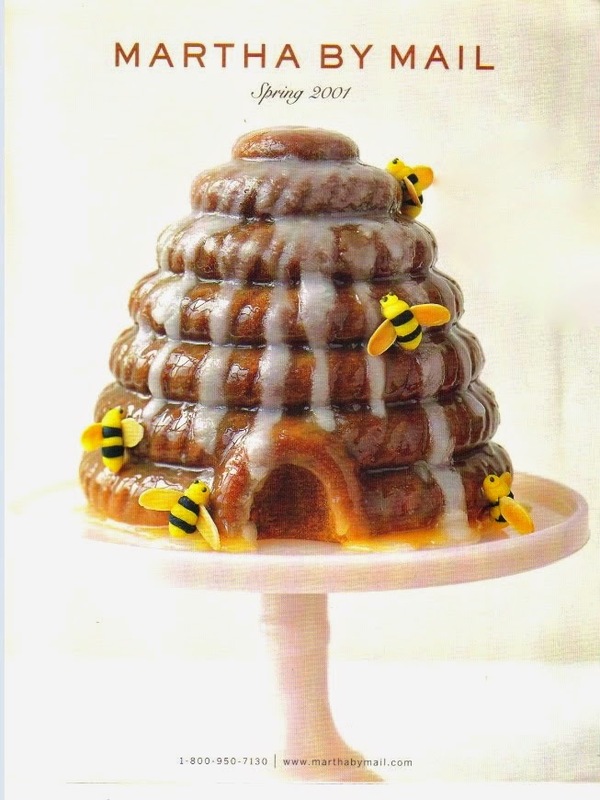 A beautiful & collectible two-part mold was used to produce this cake, while the marzipan bees were a handmade Wendy Kromer confection. All of it sits on a pink milk glass cake stand produced by L.E. Smith. I adore this cover. 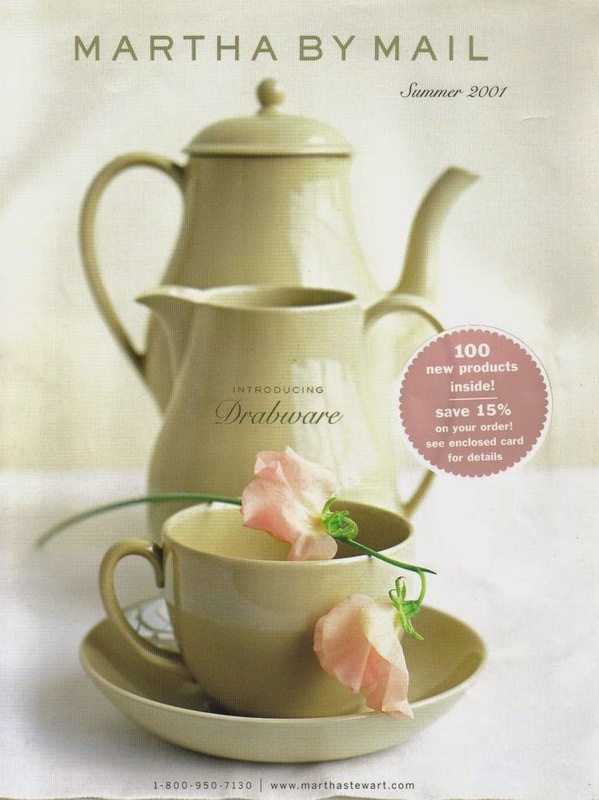 Drabware, another catalog exclusive, was produced by the venerable china company of Wedgwood. A coffeepot, milk jug, teacup and saucer grace the summer 2001 cover. This particular china pattern will forever be associated with Martha by Mail. 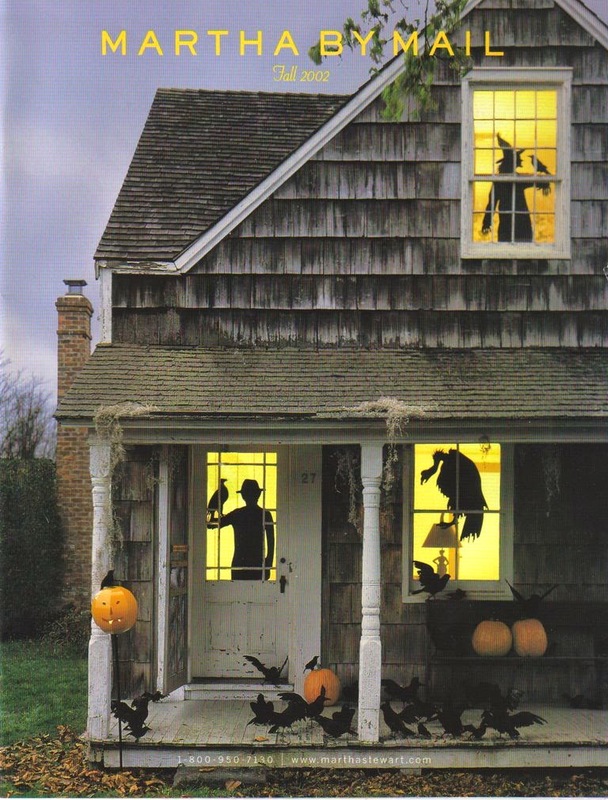 A weathered shingle-faced cottage covered in lanterns, carved pumpkins, faux crows and window silhouettes, conspire to make an eerie and spooky atmosphere. Halloween was a favorite with designers and customers of Martha by Mail. 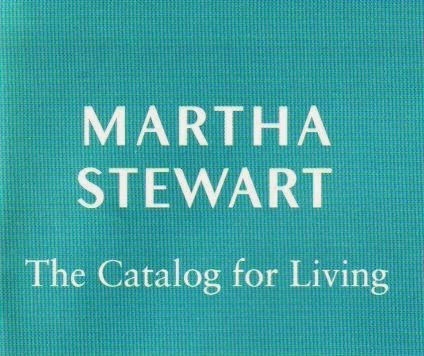 By 2002, the Martha by Mail name had changed to The Catalog for Living. 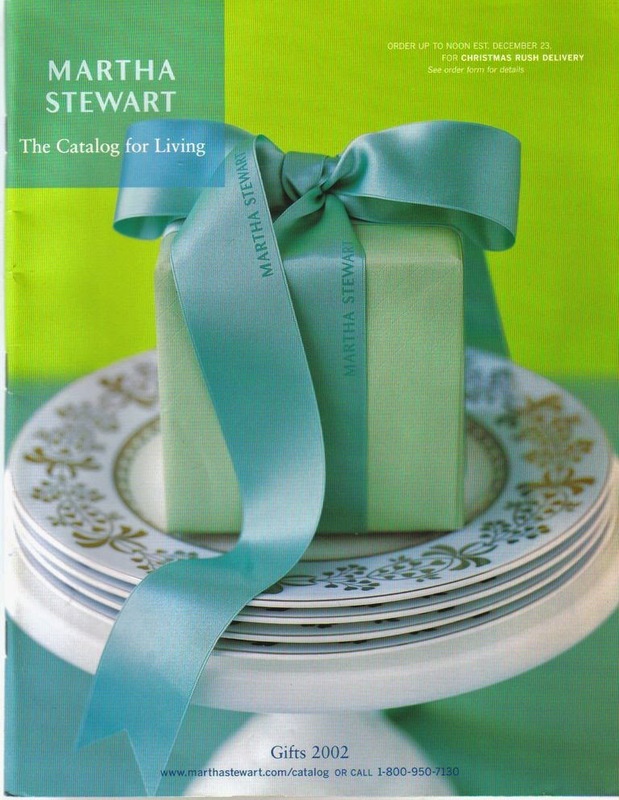 The cover shows a beribboned gift box covered in embossed paper that was the signature wrapping of Martha by Mail. Below the box is a stack of Wedgwood Platinum Scroll Plates on top of an L.E. Smith white milk glass cake stand. Finally, this was to be the last catalog ever printed before the closing of the exclusive merchandising division of MSLO. 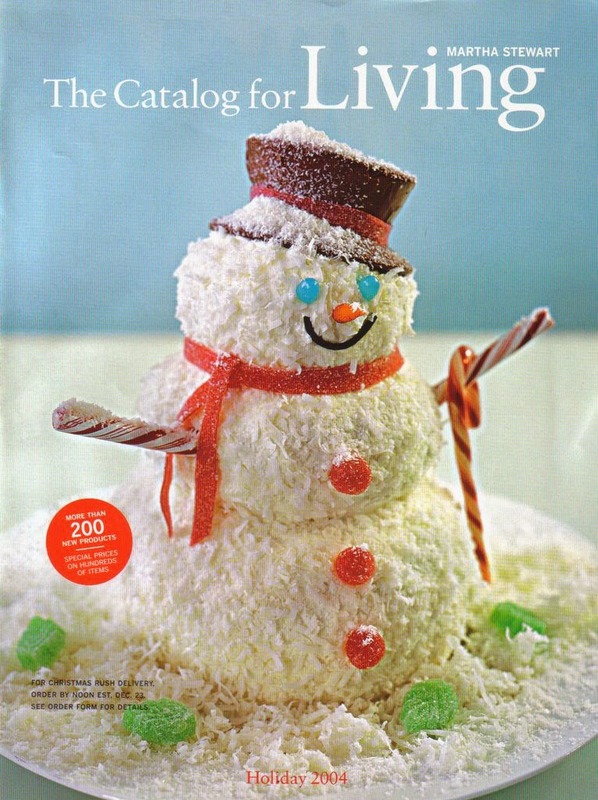 A jolly snowman cake made from a two-part mold sitting on a sweetly-decorated platter. I collect the catalogs because I love the staging of the photographs. It’s helped me with ideas on table setting, decorating, holiday, themes, etc. 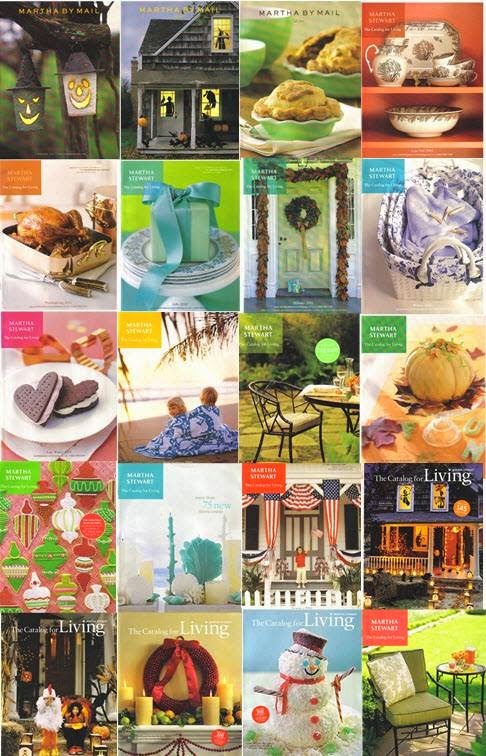 No matter if I’m entertaining at home or on a professional level, I love pulling inspiration from these catalogs. I feel as though there’s a different attention to detail in the catalogs that you would miss if you had the magazine alone. The catalog was so special, in part, because it offered perhaps the most carefully curated selection of high-quality home products ever offered through a single outlet. The sourcing efforts for assembling & commissioning such a unique and hard-to-find product selection were unprecedented. I think the catalog’s legacy is a testament to the talented MSLO teams that contributed; their passion for beauty and quality were infused in every product and on every catalog page. These products have allowed me to express a design aesthetic that I feel truly represents my style and tastes. The catalogs themselves have served as an endless mine for design inspiration. I started with Martha prior to the very first TV episode. I’d been reading about her prior to the episode and was so intrigued. I am from a small town and our local paper had shared an Altanta Journal article about Martha’s first episode describing what she wore, etc. Once I saw her ‘in person’ I was immediately hooked. The catalog introduced me to an entirely different world. Growing up, I only knew about shopping at Belk’s, JCPenney, Sears and our local hardware stores. There were things in the catalog I never knew existed. It was a long time ago, but those thoughts still stick with me. When I first got interested in Martha my mom was still here with us. She and I used to love watching Martha and we started our collection with her MBM yellow ware bowls as well as jadeite! It was special to share that with mom. I love to collect the MBM items. When I cook/bake, the end result is always better when it’s prepared just as Martha had! The quality of the products was impeccable, which you all can agree on. Oh Martha, bring back Martha by Mail! She made it cool to enjoy doing "woman duties" for both sexes and it showed in her catalog. Top of the line tools and housewares, furniture and crafts that you may not have needed but craved. You really can't find items like this today. And not one item ever went out of style. Timeless. MBM was like the Tiffany's for the domestic person or just anyone who loved quality. Her quirky personality was revealed in her picks. Where else can I find oversized cookie cutters or an outdoor table that looks like it could be in a Parisian bistro? They wear incredibly well. My poor outdoor table. I forgot to bring it in this year with all of our snow, but it survived and is still perfect. No damage whatsoever. And really, you just knew she was there for every step of production. Her stamp, her okay, her breath was on every item. If only we would have world peace and MBM again. Sigh. Martha Stewart shows you exactly how to pull it all together. With her catalog MBM you could own a piece of the lifestyle. The fabulous table arranged for a breakfast, party or holiday. Kitchen items that look as good as they work. 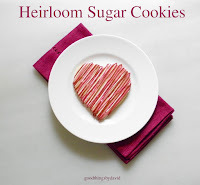 Craft kits to make the next family treasure. Martha Stewart made it easy to develop a new interest. The catalogs are a great resource for using and collecting her products. Some of the merchandise was practical and affordable. A few things were luxury pieces to be put on the wish list. All could be enjoyed for the inspiration they provided. It really is so special to own something from her line. It is so sweet my mom is always on the lookout when she second-hand-shops for MBM things or her books or magazines. My dad built me two bookshelves to hold all my Martha items and it is fun to share this interest with them! In 1997, when I looked through my first Martha by Mail catalog, we were about to move into our home. I was struck by the unique nature of the merchandise, and it resonated with my personal design sense. I had often found great inspiration for our new home when watching Martha Stewart Living and reading the magazine. I knew that Martha’s sense of style was what I wanted in our home. MBM made that easy. Over the years, I just couldn’t let go of the catalogs. Long after the business had closed, I would page through them, still finding inspiration when I wanted to do something different, or change things seasonally. All these years later, what I value most is that what was once unique is now timeless. 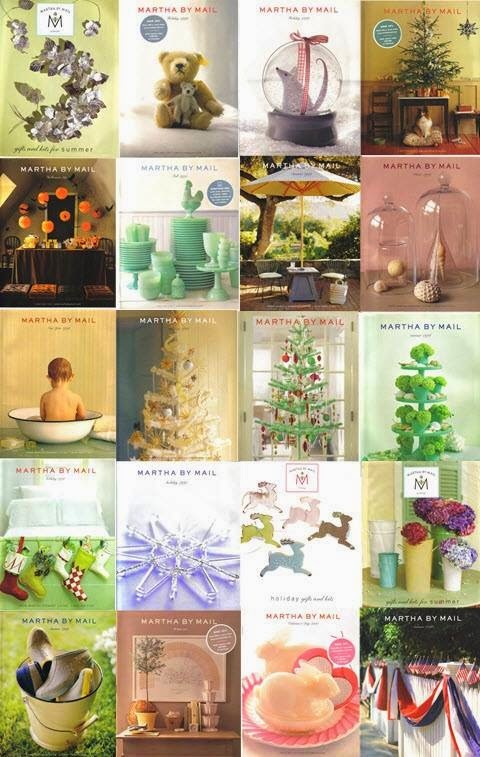 No other catalog, no other merchandise line compares to Martha by Mail. Long live the bee! Click on the link to view a complete catalog. I want to thank everyone who shared their thoughts & personal insight for this singular post. A very special thank you to Kenn, for his enthusiasm & support in helping me put this all together. Without his kind generosity, the post would not have been possible. From one collector to another, enjoy! I couldn't have done this without your enormous help and wonderful gift. Jayne, it's happened to a lot of us. I discarded my early catalogs without even thinking! They do come up on ebay if you ever want to get them! Great post! Every single catalog that I've managed to keep has a special place on my bookshelf. This is where I bought my "as-seen-on-tv" spice rack as a gift to myself for moving into my first grown-up (no roommates)apartment, storage tins, those jadeite covered rooster dishes, and my first pieces of drabware. Love, love, love! You do have a very nice collection of MBM, from what I've seen on your blog. It's so good to know that you've kept the catalogs and that you cherish your treasures! 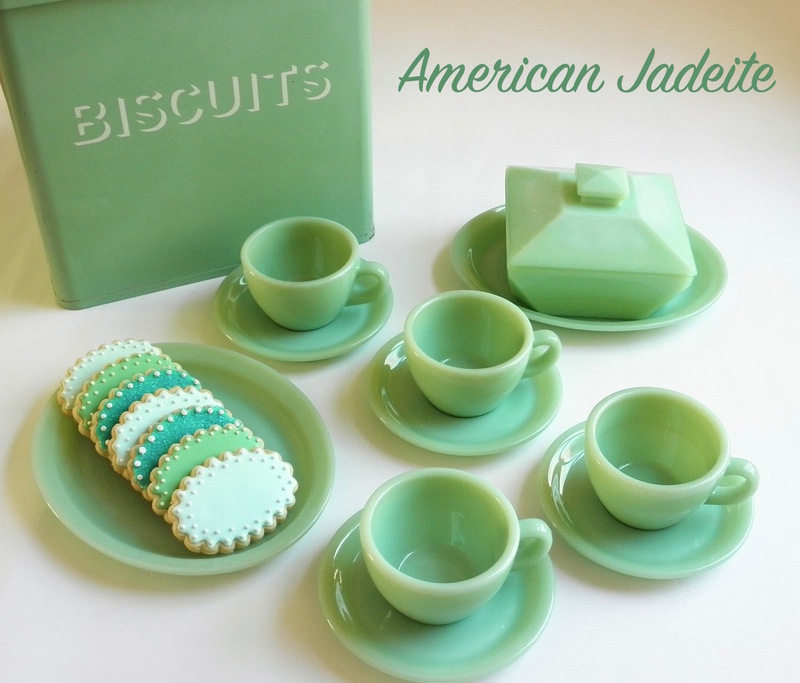 Oh, how I would LOVE to see a scan of the Fall 1999 catalog with all the Jadeite!!! Now that is something to consider! Even if it is just the pages that show the Jadeite pieces she was selling! I worked for Martha By Mail from the beginning. Decided to do a quick search to see about unloading some of the items I have from those days. I still remember when Martha came by the office to check our facility out before handing over her catalog and magazine fulfillment to us. Those were the days. How exciting for you, Chad! It must have been a great time working in such a creative environment with Martha and her team. Good days indeed! You can always email me! So I have been searching for a white matte ceramic Spring tree I purchased through the catalog years ago. Might anyone be able to help me with the product name or help with other leads on how to acquire another? It would be much appreciated. I have 3 new boxes of the Martha by Mail snow globe kits. Does anyone know the value? I'm thinking of listing on EBay or Etsy.